Timecode: Is it still important? The answer is yes. Timecode is still important. It’s a vital and fundamental skill that still has impact when shooting or editing in virtually every kind of video. This escalated to a remarkably civil discussion on the matter between him and a few other editors. I’m with Shane though. Timecode is incredibly important despite not being used in as many ways as it used to. 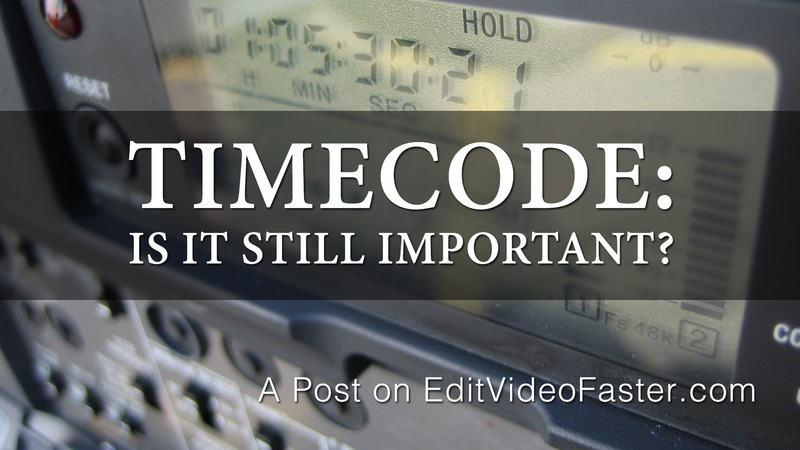 This post will go through a brief overview of what timecode is, some antiquated uses that I used it for and why it remains important to know and understand today. Timecode is a form of metadata for clips. It’s a timestamp for every frame of video. Timecode is broken up into hours, minutes, seconds and frames. Example: 01:33:28:05 = 1 hour, 33 minutes, 28 seconds and 5 frames. Our NLEs thrive on timecode. They use this metadata so you can see the frame at 01:33:28:05 in your monitor when your timeline indicator is parked there. When shooting on tape, card, whatever, there’s a timecode associated with it. Normally timecode is generated on a clip once recording is started and stops when recording is stopped. Then at the start of recording the next clip the timecode starts again on the following frame. Each frame has a specific timecode. There is also running timecode or time of day (TOD) timecode that continually runs based on a preset clock. This type of timecode works well when you are working with multiple cameras and/or external audio recording. You can much more easily sync clips between cameras/recording devices together for multicam editing. I admit it. Timecode isn’t as needed in a couple areas of video creation as it used to be. Capturing is a dying skill (even though I learned how to become a master at it). You would use a deck that’s hooked up to your NLE (with Avid those were expensive Nitris’, Mojos or Adrenalins) to grab clips off of tapes based on their timecodes. If you somehow lost the media, which used to happen a lot at least for me until I figured out a consistent workflow, you’d just pop the tape back in and your NLE would find those timecodes and re-capture those clips. Today you plug in a card or card reader and you click import (if you click anything at all!). I also used to have to “drop to tape” once a project was finished. I’d have to get a tape from the closet and put a fresh timecode on it by recording black and flicking a bunch of switches and turning knobs on the deck. Then I’d have to make sure everything starts exactly on the minute (ex: 01:05:00:00), write it all down, print it on a sheet that went in the sleeve of the tape’s box then input those numbers into the encoder which would take the tape, which had to be put in another deck, and based on the timecodes would create MPEG2s. Got that? That stuff doesn’t matter too much anymore in our world of tapeless workflows and digital encoding. But it still matters for a lot of other aspects of video creation. You have to be able to tell another editor, producer, client, director, etc. “where” something is. You find the where by using the when – timecode. I have no idea if that makes sense or not. 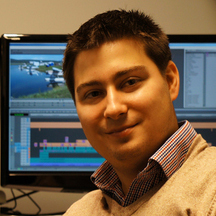 Timecode allows us to easily communicate with other individuals in the post production environment. What type of feedback would you rather get? Even for a short video when I’m the only one involved in the creation of it I find timecode important. I mark up the timeline and leave myself comments at specific times. I might see that the graphic at 01:00:08:15 during the opening animation has a glitch in it. I can go into After Effects and find the graphic exactly 8 seconds and 15 frames into the comp and fix it instead of scanning for the glitch. Even though it seems like I only saved maybe 5 seconds this stuff adds up over a week or a year or a career. I start my sequences at 00:59:00:00 (59 minutes). This is habit from the dropping to tape days. I put a 5-second slate at 00:59:50:00, 5 seconds of black then start the first video in my sequence at 01:00:00:00. By doing this it means I can park my timeline indicator on the last frame of the video and see it’s total run time (TRT). Otherwise I’d have to go to the beginning of the video, mark an in point, go to the last frame, mark an out point then check the timecode window for the in/out duration. Here’s a quick tutorial I made on how to change the starting timecode of a sequence in Avid Media Composer. Aghhhhh! You had someone shoot 24 frames per second (FPS) for a 30fps project! That of course is a dramatized example but it happens. A videographer I used to work with got a new camera that shot 24fps. All excited he went out to shoot a new video for me and came back and gave me the footage. He didn’t realize though that I still needed to use shots, 30fps shots, from other projects. So I had to do a pulldown to get everything to play nice inside of Avid but it still just didn’t look right in the end. Have you ever used a shortcut in an NLE to move down or up the timeline? Left/Right Arrows, Page Up/Down, 1-4 on the top-row numbers, typing in +100 on the numberpad… What all these do, depending on the software, is move the timeline indicator based on the timecode. @oflanada Yes, you can. But if I was an employer, and a potential employee had no clue what TC was, I wouldn't hire them. Timecode is a basic. Learn to count in frames. Learn how to do math in frames. Question: We have a non-drop frame sequence at 30fps. What will the timecode be if you add 22 frames to a starting timecode of 01:18:45:17? It might not mean much to you if you’re a recent college grad but when you’re trying to get a job with someone who learned editing reel-to-reel, this stuff matters! And that should matter to you. We still need timecode. Our NLEs still run on timecode. Some uses like capturing and dropping to tape are no longer in use but others are still thriving. Communication between the editor and everyone else happens through timecode. Videographers need to know what frame rate to shoot in. Jumping around a timeline is simple with the right shortcuts but you have to know timecode in order to correctly estimate where to navigate the timeline indicator to. Your future employment could also be riding on if you know how timecode works. But that’s just my opinion. What’s yours? Leave your thoughts in the comments! Background image by Charles Dyer from Flickr with minor modification. Just the other day the director sat in while we watched through his feature. Every once in a while he called out a change (“Use an alternate take of that shot”, “Cut to a CU of her reaction here”, etc.). Without stopping playback I would mark down the TC with a description of the change so that I could easily jump to it later. Not have to look around for “that shot of that character during that scene”. I work for a cable network and we deal with TC from tapes and discs as well as media cards that we dub over to disc. It’s amazing we’ve come to a point in the industry where we have to question where we have to explain how important timecode is. Great post! I’m a sort of recent college grad but have been doing this since 2004. Can tell you this. It blows my mind when I blow the minds of kids when I talk in frames and timecode when explain slow motion and the “film look”. Its like revelation for them. Its hugely important in digital workflow. Without that metadata in scripts, its hard to find the clips and edit points which a producer or director might want.